Why Couldn’t Patrick Leigh Fermor Finish His Masterpiece? An interesting perspective is taken in this review of The Broken Road which takes as its subject Paddy’s inability to complete his trilogy and the perils of posthumous publication. By Jason Guriel First published in The New Republic, 23 December 2014 In 1933, a 19-year-old Englishman, finding himself booted from school for holding hands with a local, decided to cross Europe on foot. He had a mind to make it from the Hook of Holland down to Constantinople—unpurple “Istanbul” would never do. Even more romantic than the goal was the gear: used rucksack (its previous owner had tramped about with the travel writer Robert Byron), Oxford Book of English Verse, and ace sidekick (Horace). He slept outdoors, but in castles, too, as freshly minted friends—an ever-expanding network of social capital—reached ahead of the young traveler, by post, to ensure he would be received by the next available count or baron. But it wasn’t until the 1970s, over four decades later, that Patrick Leigh Fermor—by then, an established author and war hero—turned his full attention to writing up the European walk. A Time of Gifts appeared in 1977, followed by Between the Woods and the Water, in 1986. By the end of the first book, Leigh Fermor’s younger self had reached the edge of Hungary; by the end of the second, Bulgaria. There he waited, stalled in 1934, for decades. A cult began to fire up after the publication of these books. Blame the affable character Leigh Fermor cuts in the first two: ravenous for knowledge but willing to risk expulsion for the girl. He’s charming, too; he tries to pay his way (“…I would make a frantic flourish with two thousand-lei notes…”), but others wave him off (“These two bits of paper sank to the symbolic role of stage currency”). After decades of angry, quirky misfits, Leigh Fermor’s charming young man—the Ur-backpacker—would’ve seemed crisp. (Today, we would bloody him with the word “privileged.”) It’s unsurprising that a cult came to be transfixed; after the walk across Europe, Leigh Fermor helped carry out the kidnapping of a German general, spent time among monks, traveled in the Caribbean, erected a house in Greece (the setting for the recent Richard Linklater film Before Midnight)—his life was so colorful it seemed to stream from a prism. But he had chops, too. Vision. His prose was the slow output of an eye committed to registering exact contours, but only in original terms. “Blown askew, the Trafalgar Square fountains twirled like mops,” he writes near the start of A Time of Gifts. “Bristling regiments of lancers moved about like counter-marching cornfields,” he writes at another point. If you’re tasked with putting over a windblown fountain or marching lancers, there are no better solutions than these. At a time when plenty of upstarts have already committed to print their formative years—when trauma is trumpeted, and meta-memoir, over-Eggered—Leigh Fermor’s patient approach to prose is positively alien. His patience may have left him paralyzed, too. In 2011, when Leigh Fermor finally died, his younger self was still stranded at the edge of Bulgaria. But there was a manuscript. The intervention of editors, and the publication of The Broken Road, the final book of the trilogy—holiest of those systems by which we mete out the franchise—gets the younger self moving again. In a slightly more just universe, people would have lined up for The Broken Road with all the enthusiasm they bring to the subject of adolescent life in dystopias. On this side of the wormhole, however, The Broken Road was published earlier this year by NYRB Classics and is coming out in paperback next month. (John Murray brought it out in England in 2013.) NYRB Classics is to literature what the Criterion Collection is to film: a prestige imprint that, by issuing niche titles in handsome editions, attempts to rescue title from niche. We long ago ceded the useful word “curate” to artisanal butchers and Pinterest, but NYRB Classics curates in the best sense. (Mary Olivier: A Life, by May Sinclair, On Being Blue, by William Gass) Over the last few years, it has restored much of Leigh Fermor’s catalogue to the bookstore and done a public good. The Broken Road, however, is far from the fully realized book Leigh Fermor’s fans were hoping for. It covers the last leg of his journey, from Bulgaria to Constantinople, but as editors Colin Thubron and Artemis Cooper explain, the new book was composed before its predecessors, in the early 1960s, when a magazine invited 5,000 words from Leigh Fermor on “The Pleasures of Walking.” Leigh Fermor, then in his forties, finally began to set down the European journey of his youth, and came to focus on the final stretch. But in the mid-1960s, he abandoned the manuscript. When he resolved to return to the subject of his European travels in the 1970s, he started over, repositioning his narrator in London, the day of departure. The rest we know: Leigh Fermor’s renewed effort produced the two best works of travel writing of the twentieth century. But for the next two decades, he was unable to make headway on a book that would bring the trilogy to an end. The editors describe a “long ice age”: the “loyal and long-suffering” publisher was lost in 1993, the wife, ten years later. Leigh Fermor consulted a psychiatrist, but his energy had been flagging for some time. “The whole subject was beginning to feel stale, barren, written out, and he feared he no longer had the strength to bring it back to life,” is how Cooper puts it, darkly, in his recent biography of Leigh Fermor. Then, in 2008, the biographer turned up a copy of the ’60s manuscript, and the writer, in his nineties and abetted by magnifying glass, began to fuss with it. Not too long after, Leigh Fermor passed away. The 40-year-old text breaks off before reaching Constantinople—breaks off in the middle of a sentence, in fact, a rough edge the editors have respected. (No ellipsis sands it down.) They have supplemented the manuscript with fragments from a diary he kept, but the impressions of Constantinople are partial, and the diary firms up and expands only when Leigh Fermor finds himself among monasteries in Greece. And that’s where The Broken Road ends. The legendary destination of Constantinople, then, remains mostly unremarked upon: a rip in space around which the book, like sparkling debris, swirls—and around which thoughts of what could have been, the thoughts of the fanboy, spin. The poignant title is an imposition of the editors; the sacred text, a salvage job: recovered by apostles from the late author’s leavings and pieced together. What’s really absent, of course, isn’t so much an account of Constantinople, as a third book written by the mature author of the first two. Thubron and Cooper are clear about the lack of polish, but it’s not until you start in on The Broken Road that you realize how crucial to his prose was the mature writer’s patient, if unsustainable, perfectionism. Generic adjectives function as placeholders for yet-to-be realized images (“amazing colours,” “amazing robes,” “amazing sunset”), or serve to reel off a character quickly (“She was so pretty, kind, funny, intelligent, and good”). When he does write well, it’s often too well: a “sweep” of land “climbs and coils and leapfrogs clean across Northern Bulgaria from Serbia to the Black Sea”—a metaphor that sounds good (listen to that alliteration) but lacks the precision of Fermor’s better prose (land doesn’t have legs). “Plumed with poplars and mulberries,” on the very first page, is lovely enough, but the plume-idea comes to be plumed again and again. He is more original elsewhere. “The dome and the walls were almost intact,” he writes of a mosque, “but most of the plaster had fallen away and the minaret was broken diagonally near its base, exposing to the moon the twist of the stairs round their central pillar like the volutes of a smashed ammonite’s fossil.” That’s enough to keep you going, if you need the pellet; fans of A Time of Gifts, who will have already sought out the hardcover, will push forward on principle. The Broken Road, after all, belongs to a class of aesthetic object that includes The Beach Boys’ Smile, Orson Welles’s The Other Side of the Wind, and Nabokov’s The Original of Laura —works that benefit from their incompleteness because they spark speculation, devotion, delusion. Reviewers certainly seemed to be reassuring themselves. “Friends and fans, acolytes, devotees and disciples can all rest easy,” declared one. “In some respects this book is even more satisfying than its predecessors…” hazarded another. Why don’t they recognize that Leigh Fermor’s failure to bring off a third book—and it is a failure, let’s not pretend otherwise—only buttresses his legend? The line that weighs down the last page of Between the Woods and the Water, “TO BE CONCLUDED”—and that applied drag to Leigh Fermor’s last decades—gains even greater pull now that we know a proper conclusion cannot be provided. Had it been provided, and promptly, we might be slightly less romantic about the author. He might strike us as less tortured, less remote. Perhaps the release of recent long-gestating albums by Guns ‘n Roses and My Bloody Valentine has dissolved some of the legend that once occluded the very real humans behind those bands. Perhaps David Foster Wallace’s estate should’ve kept back The Pale King, his unfinished novel, for a generation or two. Let the corpse of work cool. Let the cult heat up. In Fermor’s case, The Broken Road is a carefully presented box of brilliant bits: a kit for keeping up one’s enthusiasm for one of the great travel writers of the previous century. It’s also part-emptied skull, part-time capsule: like its publisher, it extracts voice from void, paper from ashbin, expertly. (“Nearly all the people in this book …” Leigh Fermor observes, “were attached to trails of powder which were already invisibly burning.”) But The Broken Road is no place to begin—as Leigh Fermor himself may have sensed when he turned away from it more than four decades ago. Those wishing to fire up an enthusiasm would do well to search out any of the other books, including especially A Time of Silence: a slim, quick account of time spent among monks, whom Fermor’s fans, in their extreme, cultish devotion, can start to resemble. 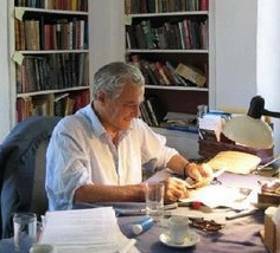 This entry was posted in Volume Three - The Broken Road and tagged Patrick Leigh Fermor, The Broken Road on December 23, 2014 by proverbs6to10. He had moved on and finding the sparkle of the journey as a young man was surely impossible. My question might be why he did not write more of his then present or imaginings. Maybe a shame that the demands of his past weighed so heavily. ” “The whole subject was beginning to feel stale, barren, written out, and he feared he no longer had the strength to bring it back to life,” is how Cooper puts it, darkly, in his recent biography of Leigh Fermor.” When last I met her, Artemis Cooper was definitely a “her” as are most people named Artemis. When I met Paddy in October 2004 at his studio I claimed that he was “writing it right now as we speak”. Sometime later it occurred to me that in fact he was indeed writing right at that moment as we speak. I can’t recall where the Archangel Gabriel appears in Broken Road, as I believe that was the image he was studying and had been jotting down notes of prior to our meeting (image above). Is that one of the pics you sent to me Sean? I want to update all sources. That is. Can’t believe that it was over ten years ago when I met Paddy and took several photos of him at work. I cant wait to finally get the paperback ( Broken Road ) and start in . I also was disappointed by the Violins of St J , but rate Mani and Roumeli as good or even better than the journey duo . Also Words of Mercury , although a palimpsest , is worth the money . And I read A Time to keep Silence several times down the years before I even noticed PLF was the author . I blame the amount of Ouzo I consume . Damned funny Monk I’d make , I must say , though I count myself a PLF Fan . Might get a novitiate at Preveli though , Raki drinking and expertise with small arms appears to be in the curriculum there . The author never reveals what Paddy told Colin Thrubron in the NYRB. Paddy had acclaimated himself so perfectly to his surroundings at home, he simply could not write. Mull that over for a moment…….. What irritates a writer to create? What animates or underwrites the beloved narcissism? If a writer comes to peace with himself or his world, the irritant removes its impact to create. Paddy was no longer the writer, the man, that composed the first two volumes. He grew. He found grace. I’m happy to believe, without having it proved chapter by chapter, that PLF reached Constantinople, or more likely Istanbul. Having regard to the density of his writing, and the corresponding difficulty of reading it – of which characteristics I have since become more conscious – I would suggest that PLF wrote enough books. For instance, The Violins of St Jacques is arguably mired in gratuitous complexity and so largely unreadable. Yes, like so many others, I was caught up in the romance of PLF’s two European travelogues. Years later, I can cope with the fact that he took us only as far as the Iron Gates. I remain glad that he took us that far, and now today I’m at least as glad that he took us no further. As with so many authors – even great ones – he had, I think, only so much to give. Broadly agreeing with that one Willie. Often neglected in such conversations are Mani and Roumeli which I don’t think are so dense. They are much more accessible and I would often recommend Roumeli as a starting point. Time to Keep Silence is also a much more accessible read. I read St Jacques – quite poor. Three Letters is ok but nothing special. I think that you are right. He only had a few in him but those few worth reading are masterpieces.